San Diego Derby United has a multi-tier training system to get you ready to become a full-fledged roller derby player. After attending orientation, new athletes join a 2-level Bootcamp training program to groom them into great skaters. After graduating from Bootcamp, skaters to move on to become league members who attend more challenging practices, skate in scrimmages and become draft eligible for Derby United and SoCal Derby teams. San Diego Derby United is guided by a commitment to athleticism, empowerment, inclusion, and respect, and that is at the core of our adult training programs. Bootcamp is divided into 2 different levels, designed to teach you the skills need to become a roller derby player from the ground up. Level 1 covers the most basic skills needed to safely skate, stop, fall, and have control on roller skates. These techniques will become the foundation blocks to develop new skaters into great roller derby players. Stride, stance, knee-slides, and plow stops are among the skills Bootcampers learn in their first classes. From there, agility and speed are incorporated to round out new recruits’ skating skills. 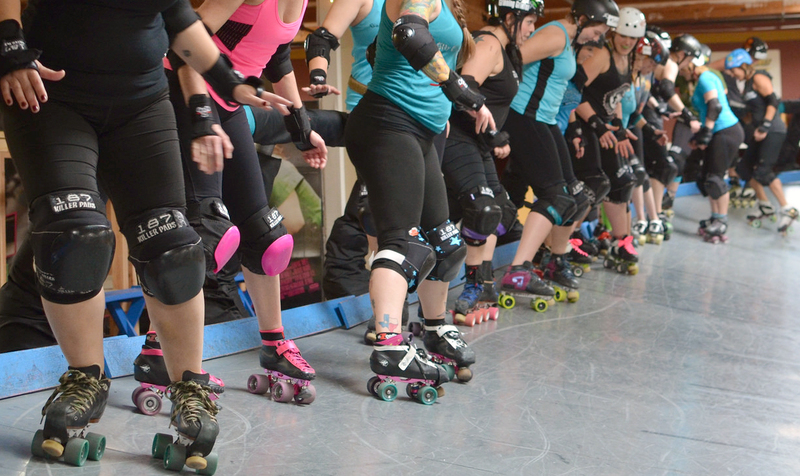 Level 2 will begin to develop more roller derby related skills including jumps, transitions, and positional blocking. 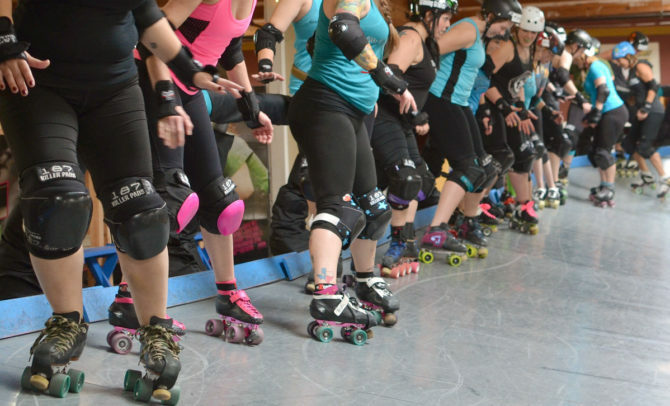 From there, we’ll teach you to give and receive full body contact for playing roller derby. This is when strategy and plays will begin to start becoming clearer as skaters practice and watch games and scrimmages. Upon completion of the Bootcamp program, players will assist with referees during scrimmages and become eligible to participate in league practices. This is when a skater’s voyage to becoming a great roller derby player will ramp up to the next level of training and intensity. Women become eligible for Derby United and SoCal Derby women’s teams. Men and Unrestricted Gender participants become eligible for the Aftershocks. Once enrolled, prospective members will receive their membership free of charge for the remainder of the month during which they attended orientation. All memberships are paid via autopay on the online Member Portal on the 1st of every month. New members must have a payment method on file before the 1st day of the month following their orientation to remain active. Bootcamp membership is month-to-month and may be canceled at any time (with 2 business days notice for cancellation to take effect). Details may be found in the Roller Derby 360 Membership Agreement. No experience at all is needed and there are no try-outs. Just come to orientation and hear all about how the program works. San Diego Derby United hosts a no-commitment, informational orientation for skaters interested in joining the organization every month. During orientation, potential recruits will be provided more information pertaining to the league philosophies, what to expect at practices, and how to get started. Additionally, orientation attendees will be treated to a league scrimmage with knowledgeable coaches standing by to give explanations and answer questions about the game.